A mattress pad or a mattress topper is a type of layering material that is placed on top of our bed’s mattresses (usually with fitted sheets) to increase cushioning as well as protecting our mattresses at the same time. 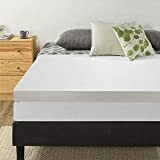 Typically, a mattress pad is added to protect mattresses from accidental spills and other forms of mess which can cause stains and can potentially decrease the mattress’ longevity. Other than that, it is usually added to provide another soft layer between the user and the mattress (since some mattresses are not that comfortable to sleep with). Mattress pads are made from various materials such as cotton, foam, polyester, and other smooth fabrics which are comfortable enough to sleep on. Some modern types also make use of memory foam to provide additional support to the person’s body upon sleeping and prevent any strains which are often caused by improper positioning of the body during sleep. Moreover, visco-elastic foams are also added to hospital beds and other medical institutions to relieve any pressure-related pains caused by lying over long periods of time. Overall, the main purpose of adding a mattress pad is to provide utmost comfort and cushioning to make the person feel “weightless” and conditioning the body to a deep slumber. This pad uses electrical power to head up the pad and provides warmth to the person. It follows the same concept as the electric blanket, but the only difference is the user is heated from below. Electric pads are often heated before use (pre-heated), but some people prefer to sleep with it while turned on. This type of pad is specifically designed to contour the shape of the person’s body to provide optimum support during sleep and displace any undue pressure from all over the body. Memory foam pads are usually 3 inches thick and can perform better with memory foam pillows. This type of pad employs the use of magnetic technology as emitted by disc-shaped ceramic magnets. Magnetic pads are ideal for individuals who are suffering from insomnia, arthritis, and other forms of bodily pain because of the therapeutic effect it brings every time a person lies in it. This pad is named as such because it looks like an egg crate. The design of the foam provides a softer layer when placed over a tough mattress. A person who is experiencing arthritic pain can also find relief when sleeping with this pad because of its therapeutic abilities. It’s also effective when paired with egg crate foam pillows. This type of pad is perfect for people who have kids at home especially, toddlers. In this stage, kids are often seen jumping on mattresses and peeing on it during night time. So it’s better to use these pads as latex can protect the mattresses from unwanted stains (pen, pee, poop, etc.) and keeps the mattress free from smelly odor at the same time. Sometimes called ‘feathered pads,’ this type of pad is best used to make the bed feel warm and cozy. Another feature that is found only in mattress protector is that they are designed to snug around the mattress with ease. That’s why they are made according to the standard dimensions of mattresses in use today. Moreover, they are made of vinyl or plastic fabrics which can cause noise every time you turn around during sleep. Definitely one of the best products we have here, the quality of this mattress pad is unlike any other conventional mattress pads you can find on the market today. The 2.5 inch thick of gel infused memory foam is ideal for providing the best comfort feel to help you sleep soundly through the night. What’s more is that the material can distribute heat evenly to help you feel warm and cozy as you take your beauty rest. What’s even better is that is the product is on sale today with 3-year warranty included! So don’t miss out on having this fine mattress topper today. The American Baby Company Organic Cotton Quilted Crib & Toddler Crib Size Fitted Mattress Pad is made of 100% organic cotton interlock on top then followed by 9” thick breathable polyester fabric on the middle and breathable waterproof polyester fabric at the bottom. The entire cover is measured 28” by 52” and its ideal for mattresses up to 6 inches thick. What’s great about this product is, of course, the ability to prevent any moisture from penetrating your bed’s mattress. And if your baby accidentally wet the pad over the course of his sleep, rest assured no funny or stingy smell will be retained. Moreover, this product is also machine wash friendly. All you need is some mild detergent and set your washer into the gentle cycle setting, and that’s it. Just make sure to wash the item with cold water (use nonchlorine bleach if needed) and soon it will be as good as new. It’s no secret that memory foam provides a fine sleeping place anytime you like to take a rest. 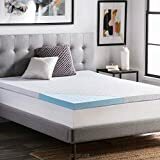 But your sleeping experience will change for the better once you have this in your bedroom.The memory foam used in the Best Price Mattress Pad is capable of regulating the temperature of the body. Aside from that, this also includes a responsive active suspension feature which allows you to isolate your motion to your area of the bed and prevent your partner from being disturbed. Feel Cooler is one of the best in the business when it comes to mattress toppers. In fact, this product is being featured in “The Doctors” TV show in CBS and one of the issues of Reader’s Digest. The Cooling Mattress Pad comes with a temperature regulating material which interacts positively with the body temperature once it touches the skin. In other words, this product can absorb or release heat whenever needed to help the user sleep comfortably. So no more waking up in the middle of the night just because you feel hot because the Cooler Mattress Pad will guarantee to absorb all the heat away to help cool you off. Mattress pads are made to handle excessive amounts of moisture that can occur any time as a result of increased sweating and accidental spills (coffee, juice, water, etc.). The thick composition of the pad allows the moisture to seep into the material and keep the surface dry (of course, you have to allow the pad to “breathe out” the moisture over time). Mattresses are not made soft. Hence, they are not that ideal for sleeping with as is because it this will only lead to back pains and countless nights of sleeplessness. Having a mattress pad will add a layer of cushion to reduce the amount of pressure felt and eventually help the body to feel at ease in preparation for a better sleep. Obviously, no one would want to sleep on a bed that is stingy or has a funny smell. And though no matter how hard we try to prevent our beds from producing the foul smell, accidents do happen which can result to putrid pee scent, disgusting smell of poop, stench caused by sweat, and a lot more. Having a mattress pad will prevent all of these odors as it is designed to eliminate these odors and keep your beds smelling fresh all the time. Mattress pads are the ultimate protection for keeping your mattress stain free and clean looking, making it an enticing place to sleep in whenever you need to take a rest.